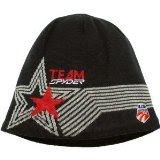 Check out this cool gift idea for him, and help him keep his head warm like an Olympian with the Spyder US Ski Team Beanie for Men. This soft acrylic rib-knit hat with microfleece lining sports an official US Ski Team shield patch he can wear with pride. Recommended use: casual.